We’d love your help. Let us know what’s wrong with this preview of Rome Sweet Home by Scott Hahn. To ask other readers questions about Rome Sweet Home, please sign up. Scott Hahn is a talented musician who enjoys entertaining. He reads incessantly and plays the religious tune he has memorized perfectly, but nothing suggests he can compose new religious messages that help Catholicism evolve and survive this century. That’s a real-world dilemma the Pope faces! Will Hahn be able to help the Pope? I wasn't really sure that I'd like this book because there was a lot that I didn't think I'd relate to. After all, it's a book about a couple converting from the Protestant faith to Catholicism, and I came from an atheist background. Second, Dr. Hahn and his wife studied their way into the Church, and my conversion was anything but academic. However, the Holy Spirit was so present in this book that, despite myself, I often found myself laughing out loud or on the verge of tears! And this is anyth I wasn't really sure that I'd like this book because there was a lot that I didn't think I'd relate to. After all, it's a book about a couple converting from the Protestant faith to Catholicism, and I came from an atheist background. Second, Dr. Hahn and his wife studied their way into the Church, and my conversion was anything but academic. However, the Holy Spirit was so present in this book that, despite myself, I often found myself laughing out loud or on the verge of tears! And this is anything but typical for me! I should mention that I read this from the perspective of a non Catholic (at least currently). When I took a vacation to Rome the places which I constantly found to be the most impressive were not the big archeological sites like the Colosseum or the Forum, but instead it was the beautiful churches. I have always attended plain Protestant churches and I was surprised at just how beautiful the inside of these buildings were, full of paintings of biblical events and statues of biblical figures and I should mention that I read this from the perspective of a non Catholic (at least currently). When I took a vacation to Rome the places which I constantly found to be the most impressive were not the big archeological sites like the Colosseum or the Forum, but instead it was the beautiful churches. I have always attended plain Protestant churches and I was surprised at just how beautiful the inside of these buildings were, full of paintings of biblical events and statues of biblical figures and popes (and according to one place the chains of Peter). Growing up I had always heard of the worshiping of statutes/idols by Catholics, but when I entered the churches, I didn't sense a feeling of idol worship, but instead looking at the statues/paintings I saw a love for what Christ did and I though about what had transpired and it was inspirational. Being there lead me to an interest to find out more about Catholicism, and so I finally read this book which a guy from work kept recommending. 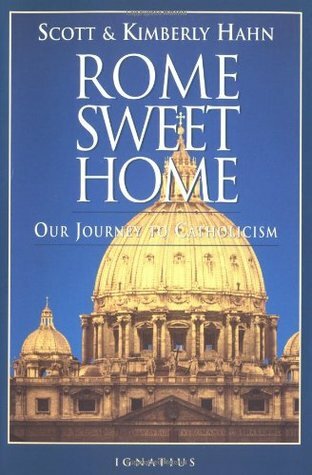 Quoting the excerpt Scott Hahn shared on his fanpage, written by a girl named Bernadette: 'After a couple weeks of captivating late night reading, I have finished the incredible book, Rome Sweet Home, by Scott & Kimberly Hahn, two converts to Roman Catholicism. As someone born into the Catholic Church, it was cool and interesting to learn of and experience the journey taken by evangelical Protestants to come home to the very Church created by Christ. Their journey was particularly intriguing Quoting the excerpt Scott Hahn shared on his fanpage, written by a girl named Bernadette: 'After a couple weeks of captivating late night reading, I have finished the incredible book, Rome Sweet Home, by Scott & Kimberly Hahn, two converts to Roman Catholicism. As someone born into the Catholic Church, it was cool and interesting to learn of and experience the journey taken by evangelical Protestants to come home to the very Church created by Christ. Their journey was particularly intriguing, though, because Scott was an anti-Catholic pastor, at first, and the way he came to find Truth was through his in-depth study of Scripture. Reason for Reading: Popular Catholic theologian Scott Hahn has written many books and I would like to read several of them. Before I started those, however, I thought I would start with this, his conversion story. Comments: What can I say? An absolutely, inspirational story of a very difficult, journey that Scott and his wife found themselves on that ended with them coming home to the Church. Scott was a Presbyterian minister, self described as vehemently anti-Catholic, to the point where he didn Reason for Reading: Popular Catholic theologian Scott Hahn has written many books and I would like to read several of them. Before I started those, however, I thought I would start with this, his conversion story. Comments: What can I say? An absolutely, inspirational story of a very difficult, journey that Scott and his wife found themselves on that ended with them coming home to the Church. Scott was a Presbyterian minister, self described as vehemently anti-Catholic, to the point where he didn't believe Catholics were even Christians and wouldn't go to Heaven. His wife's feelings were not so strong. She allowed Catholics a place in Heaven but was against everything she thought they taught. It was from this mindset that Scott Hahn delves deeper into his own personal Bible studies to find himself coming up with truths that echo Catholic beliefs. Scott reaches out to many highly regarded professors, theologians and friends in the ministry for help to counter the Catholic beliefs that scripture is leading him towards, but none can adequately do so. In fact, several of them end up on their own journeys to conversion! The book is a beautiful, inspiring and exciting read as the Catholic beliefs and doctrines are biblically explained with scripture. As a Catholic myself I found it wonderful to see Scott's light bulb moments, to see the truths of the Catholic Church come rushing forward when he and others looked at them with open hearts. The first part of the book is hard to read as Scott pulls no punches in letting the reader know just how anti-Catholic he was but this serves to show how far he had to travel on his journey. The book also shows the wonderful devoted relationship through Christ he and his wife Kimberly share as he gets closer to conversion she pulls further away yet their marriage holds together even when others interfere with the suggestion of the "D"-word. You dont have to be a convert to appreciate this book. Im a "cradle Catholic" and this book made me appreciate my faith more. Also, although it is pretty shameful and hard to swallow but he is right about one thing: Catholics all over the world should really learn how to read the Bible by themselves and learn about Catholicism more. "Yep, sometimes it takes an immigrant to explain it for the natives." Also, this shows both the beautiful and ugly sides of Catholics. Although there are some bad fruit You dont have to be a convert to appreciate this book. Im a "cradle Catholic" and this book made me appreciate my faith more. Also, this shows both the beautiful and ugly sides of Catholics. Although there are some bad fruits in the bunch, it doesn't mean all fruits are bad as well. All in all, a great read! What did I think? Well, I'm Catholic now. In reality though, while it is under one of the most repulsive titles for a protestant, he describes his journey to the Church in a way that Protestants might understand without the vocabulary that most Catholics use — he uses protestant terms to describe Catholic elements of faith. That, I think, is what makes this so compelling, as well as his description of his earnest pursuit of truth. I love conversion stories and have always enjoyed listening to Dr Scott Hahn, a famous convert, who brings complex theological issues down to a level that even *I* can understand so I thought the book by he and his wife, Kimberly, Rome Sweet Home, would be a happy story. Well, it didn’t start out that way! I knew they had a happy ending because both they and their children made it into the Catholic Church many years ago but the book covered the whole process of their discovery of the fullness of I love conversion stories and have always enjoyed listening to Dr Scott Hahn, a famous convert, who brings complex theological issues down to a level that even *I* can understand so I thought the book by he and his wife, Kimberly, Rome Sweet Home, would be a happy story. Well, it didn’t start out that way! I knew they had a happy ending because both they and their children made it into the Catholic Church many years ago but the book covered the whole process of their discovery of the fullness of Truth of the Catholic Church. First Kimberly made the discovery that the Church was correct about contraception (this book was written in the early 1990s by the way). Then Scott questioned one tenet of Protestantism, sola fide, and for him, that started unraveling the whole ball of yarn. He fought his conversion every step of the way, at least in the beginning and Kimberly, while being a supportive wife, fought the idea and prayed and read books and prayed some more. Hahn's book is a fascinating and heartbreaking read. He at least makes clear the many differences that continue to divide Protestants and Catholics. As R. C. Sproul reminds us, we are not together. Hahn says it perfectly when he declares that if the Catholic church is wrong, "it was nothing less than diabolical." And diabolical It truly is. Knowing this, the Hahn's were still shocked and hurt when some of their Protestant friends did not accept their swim to the other side as a good and right th Hahn's book is a fascinating and heartbreaking read. He at least makes clear the many differences that continue to divide Protestants and Catholics. As R. C. Sproul reminds us, we are not together. Hahn says it perfectly when he declares that if the Catholic church is wrong, "it was nothing less than diabolical." And diabolical It truly is. Knowing this, the Hahn's were still shocked and hurt when some of their Protestant friends did not accept their swim to the other side as a good and right thing. Perhaps there wouldn't be as much fuss about it today, for our current ecumenical spirit seems to encourage such conversions, albeit unintentionally, perhaps, and while we might be troubled by a Protestant joining the Catholic or Orthodox Churces, we fail to grasp what a devastating abandoning of Truth has just occurred. We used to call it apostasy. This book was ridiculously frustrating. I was born and raised Catholic and decided to leave the Catholic Church in 2012 after being granted an annulment. My entire family is Catholic, as is my husband’s family. I wanted to read this book to see if it could explain some of the things the Catholic Church practices which I found to be extremely hurtful and isolating. I have wanted answers for a long time. I guess I got some answers from this book, but the delivery was quite condescending. It felt m This book was ridiculously frustrating. I was born and raised Catholic and decided to leave the Catholic Church in 2012 after being granted an annulment. My entire family is Catholic, as is my husband’s family. I wanted to read this book to see if it could explain some of the things the Catholic Church practices which I found to be extremely hurtful and isolating. I have wanted answers for a long time. I guess I got some answers from this book, but the delivery was quite condescending. It felt more like they were justifying their reasons to join an elite club than anything else. I don’t believe it should take 4 degrees in theology to understand a religion. The grace of Jesus is available to everyone, and there’s nothing complicated about that. The only reason I gave this book 2 stars was because the beginning was very engaging- but, as it progressed, it gained an air of superiority that was very disappointing. At the end of the book, Scott finally meets the Pope and presents him with a “beautifully packaged set of my tape series on ‘Answering Common Objections’”, I was done. Good thing there were only a couple of pages left. I admire the dedication of the Hahns to their faith, but they are very ignorant about how many Catholics are raised: to believe certain things “because its tradition”, to not be encouraged to ask questions or read the Bible for yourself, etc. Kimberly Hahn states, “I was amazed how deeply the liturgy touched me. The call to repentance was so clear, I wondered how several ex-Catholic friends had missed it when they said they had never been called to the gospel in the Catholic Church.” Personally, I can recite the Mass to you backwards, forwards, and upside-down, but I have no idea what the majority of it means. A motivational and inspiring account by a husband & wife couple who started off as rabid anti-Catholics who, through intellectual honesty and open-mindedness as well as spiritual inspiration and open hearts, made the faith journey to the staunch Catholic apologetics that they are now. Chockfull of quote worthy, highlight-worthy passages. A worthy companion piece to the works of Karl Keating and Patrick Madrid in providing the spiritual ammunition to defend one's Catholic faith against the non-stop and misguided accusations of so-called "Bible Christians." Dominus Vobiscum. --p. 5: "Please understand, my ardent anti-Catholicism sprang from a zeal for God and a charitable desire to help Catholics be Christians. And it was the Catholics who could outdrink and outswear me before I became a Christian, so I knew how much help they needed." Haha. --p. 10: "Kimberly means 'warrior maiden' in Gaelic." Och aye, lass, ye learn something new every day! --p. 16: "For one thing, I learned that many so-called Bible Christians prefer to base their beliefs on feelings, without praying and thinking through Scripture." --p. 21: "On September 31," say what?!?! Typo?? --p. 28: "So I resorted to an old family saying: 'Even a blind hog can find an acorn.' I mean, after two thousand years, the Catholic Church was bound to get something right." I thought it was a blind squirrel, but eh, why nitpick? "Sometimes we would get together on Friday nights, meeting at Howard Johnson’s or some local pub for pizza and beer in order to talk theology until three in the morning," well, at least they weren't the militant teetotaller holier-than-thou temperance types! p. 30: "In fact, I discovered that nowhere did Saint Paul ever teach that we were justified by faith alone! Sola fide was unscriptural!" But so many "Bible Christians" are too closed-minded to ever acknowledge this fact. --p. 32: "In James 2: 24, the Bible teaches that 'a man is justified by works and not by faith alone.' Besides, Saint Paul said in 1 Corinthians 13: 2, '. . . if I have all faith so as to remove mountains, but have not love, I am nothing.'" --p. 41: "We gradually became convinced that Martin Luther let his theological convictions contradict the very Scripture that he supposedly chose to obey rather than the Catholic Church." --p. 44: "I had already shown my parishioners that the one and only place where Christ used the word 'covenant' was when he instituted the Eucharist, or communion, as we called it. Yet we only took communion four times a year." p. 45: "Next I took my parishioners through the Gospel of John, and, much to my shock, I discovered that the Gospel was loaded with sacramental imagery." --p. 52: "'Yeah, 2 Thessalonians 2: 15”' I said weakly. 'What does that say again?' 'Paul tells the Thessalonians, "So then, brethren, stand firm and hold to the traditions which you were taught by us, either by word of mouth or by letter."'" --p. 53: "'**you really can’t demonstrate sola scriptura from Scripture. The Bible doesn’t expressly declare that it is the Christian’s only authority. ** In other words, Scott, sola scriptura is essentially the historic confession of the Reformers, over and against the Catholic claim that it is Scripture plus the Church and Tradition. For us, then, it is a theological presupposition, our starting point rather than a proven conclusion.'" [emphasis added] WOW!! --p. 99: "After finishing one particularly exciting session—on 'A Biblical Explanation of Indulgences'—an older parishioner named Joe announced, 'Yep, sometimes it takes an immigrant to explain it for the natives.'" Haha, true enough, kinda like with patriotism, i.e. naturalised citizens schooling native-born ones. --p. 175: "We appreciated our evangelical tradition, where people sing and pray wholeheartedly. So, one of the elements of worship our family has most appreciated at Franciscan University is the way people participate. As Scott says, 'If the Eucharist doesn’t make you want to sing, what would?'" And as more than one of my priests and fellow Catholic lay members has said, "When you sing, you pray twice." I attended Catholic Mass with my parents this past weekend and was handed this book on the way out. (They were passing out to all.) My parents had already received a copy at another parish, but since I am no longer Catholic and attending mass regularly I had not so I took one. It tells the story of a Presbyterian minister and theology student and his wife who slowly convert to Catholocism. They reveal that their study of scripture led them this way and away form Protestantism. This was an intere I attended Catholic Mass with my parents this past weekend and was handed this book on the way out. (They were passing out to all.) My parents had already received a copy at another parish, but since I am no longer Catholic and attending mass regularly I had not so I took one. It tells the story of a Presbyterian minister and theology student and his wife who slowly convert to Catholocism. They reveal that their study of scripture led them this way and away form Protestantism. This was an interesting read since I had recently left the Catholic church for a Methodist church. I found it ironic that many of the reasons that this couple was driven towards Catholicism were the reasons I was led away. The Hahns are very devout and take scripture very literally so it interesting that they were eventually led towards Catholicism which is not a bible-based or as they put it "sola scriptura" religion. I could totally understand their arguments put forth in the book supporting their conversion and I credit them for following their hearts and the call of the Holy Spirit. I could also relate to their struggles with their family and friends in taking this huge step of conversion. I own many of Scott Hahn's books and have listened to several of his talks, so I figured it was about time I read the conversion memoir he co-wrote with his wife Kimberly. Hahn was raised in a nominally Protestant home and accepted Christ after spending most of his high school years as a juvenile delinquent. He turned his life around and went to seminary to become a Presbyterian pastor. It was there that he met and eventually married Kimberly, a daughter and sister of Presbyterian pastors who ha I own many of Scott Hahn's books and have listened to several of his talks, so I figured it was about time I read the conversion memoir he co-wrote with his wife Kimberly. Hahn was raised in a nominally Protestant home and accepted Christ after spending most of his high school years as a juvenile delinquent. He turned his life around and went to seminary to become a Presbyterian pastor. It was there that he met and eventually married Kimberly, a daughter and sister of Presbyterian pastors who had been a passionate follower of Jesus her whole life. Scott and Kimberly both had anti-Catholic leanings, out of sincere ignorance rather than malice. Their conversion was the result of a gradual acceptance of various Catholic doctrines after years of intense study. This led to Scott's conversion and eventually Kimberly's. Kimberly's story ended up being more interesting to me than Scott's - my heart broke for her as her lifelong dream of being a pastor's wife was shattered, completely upending her entire life. Poor Kimberly bore many heavy crosses for years, including not only a shaky marriage but also the loss of two unborn babies. I rejoiced for her and her family when she was finally able to accept all the Catholic Church's doctrines and receive the grace of communion and confirmation. Her witness was such an inspiration to me. Her quotations from the prayer journal she kept during those years convicted me to restart my own prayer journal. I am a lifetime Protestant. I also believe in the "church universal" and that all people of Christian faith should lift up each other in their walks through the world we navigate. I give this book 2 stars because I appreciated Scott's clear description of the theology he explored and how he came to terms with the Catholic interpretations of scripture. I learned quite a bit about the history of God's covenants, Peter, the Host, and the theology of Mary; these things were very well explained. The I am a lifetime Protestant. I also believe in the "church universal" and that all people of Christian faith should lift up each other in their walks through the world we navigate. I give this book 2 stars because I appreciated Scott's clear description of the theology he explored and how he came to terms with the Catholic interpretations of scripture. I learned quite a bit about the history of God's covenants, Peter, the Host, and the theology of Mary; these things were very well explained. The one thing I related to also, was the love and comfort of liturgy. I've just changed churches and have joined a church that practices more liturgy than the one I have been attending for the last four years. I didn't realize how much I missed it. So, I understand how meaningful it was for this couple. I learned so much from this book and it answered many questions I had and even some I didnt know to ask. I want to read everything Scott Hahn has written. I am so impressed with his desire to know the answers right from the source and not just trust what other tell him. It just proves to us that even the most credible sources are not alway right. Scott Hahn était un évangélique anti-catholique plus que convaincu et professeur au Gordon-Cornwell Seminary aux États-Unis. Il est maintenant un des apologètes catholiques les plus connus. Ce livre relate le cheminement théologique de leur couple. Depuis quelques années plusieurs personnes ont quitté le mouvement évangélique pour retourner à l'église romaine ou à l'église anglicane. Ce « changement de mouvement » est souvent davantage une frustration des côtés négatifs du protestantisme évangélique anabaptiste qu'une réelle conviction que l'église de Rome est davantage la bonne église. Je suis bien prêt à admettre que l'Église évangélique a plusieurs « shortcomings » mais que l'église, sous le principe de la Réforme – semper reformada – peut et doit être réformée à partir de l'Écriture. Retourner à Rome donne peut être l'impression de « régler » certaines des déficiences des évangéliques mais je suis convaincu que ce qui est perdu est trop grand. Premièrement, la raison principale pour laquelle je ne peux – et ne veux - pas être un catholique romain est que l'église romaine n'est pas l'église catholique indivisée des premiers conciles. Ceci est bien démontré par le schisme de 1054 entre l'église catholique romaine et l'église orthodoxe (l'orthodoxie étant « le bon dogme ». L'église orthodoxe ne pouvait accepter, entre autres, la suprémacie juridique de l'évêque de Rome ni le fait que Rome se permette, unilatéralement, de rajouter la cause filioque au Crédo de Nicée-Constantinople. De plus, la Réforme protestante est arrivée pour une raison. Cette raison est que le Moyen-Âge a vu naître de nombreux nouveaux dogmes, étrangers à l'Écriture. Dans les faits, une des prérogatives dangereuse du pape est la formulation de nouvelles doctrines (tel l'Immaculée-conception ou l'assomption de Marie) et l'infaillibilité papale. Les protestants reconnaissent une certaine tradition. Il faut faire une différence entre « les traditions des hommes » et les enseignements (tradition transmise par les) des apôtres de Jésus-Christ. En somme, les protestants croient à la tradition apostolique en ce que, de toutes évidences, celle-ci se retrouve dans le Nouveau testament. Quand cela a trait à l'enseignement des apôtres a question à se poser est : « Est-il possible que les apôtres aient enseigné des choses qui ne se trouvent pas dans les lettres du Nouveau Testament ? ». Il faut comprendre que par la fin du premier siècle, le Nouveau testament n'était pas encore entre les mains de l'église entière. Certains enseignements des apôtres, dit-on, ont été conservé par leurs disciples (Clément de Rome, Papias, Ignace). On sait notamment que nous avons « perdus » une lettre de Paul aux Corinthiens. En ce sens, le rôle de la tradition apostolique n'est pas de développer de nouvelles doctrines mais d'éclairer celles que nous avons (dans le Nouveau Testament). En d'autres mots, les apôtres ont-il enseigné ou statuer sur des choses sans que cela se retrouve dans le Nouveau testament ? C'est là l'essence du débat sur les questions de la structure d'église, le déroulement de la célébration et baptême des enfants. Les réformés et les luthériens enseignent en ce sens le baptême des enfants étant très tôt dans l'histoire et comme découlant de l'enseignement des apôtres alors que les baptistes soulignent que si Dieu avait trouvé ces choses si importantes, nous les trouverions dans l'Écriture. Quoique nous en disions, il faut nous rendre compte que l'idée de la complétion du canon du Nouveau testament est une déduction théologique (que je crois être valide) mais une déduction théologique quand même. En ce sens, dans une première étape, ce n'est pas le Nouveau testament qui a une autorité en lui-même mais nous reconnaissons le Nouveau testament comme parole de Dieu à cause de l'autorité que le Christ a donné à ses apôtres. Le Nouveau Testament a une autorité parce que nous reconnaissons la marque de l'Esprit de Dieu et l'autorité apostolique (qui a été un critère lorsqu'il fut le temps de délimiter le canon du Nouveau Testament). En ce sens, l'épitre de Clément à Rome – contemporaine à l'apocalypse et dont l'inclusion a été considérée dans le Canon – ne se voit pas reconnaître une autorité canonique. Clément, malgré sa position dans l'église primitive, n'était pas un apôtre. Son écrit n'est pas à être rejeté comme « apocryphe » mais il n'a tout simplement pas à être considéré inspiré comme les écrits des apôtres. En ce sens, la « tradition » ou les premier pères de par leur proximité aux apôtres sont des « commentaires », des lumières sur le sens de l'Écriture et sur ce que les apôtres ont donnée comme enseignement mais n'ont pas la même autorité. Il en est de même de la Didaché. Comme le disaient si bien Calvin et Luther, si une doctrine ne se trouve pas chez les premiers pères il s'agit d'un excellent signe pour détecter une hérésie. Toutefois, il est tout aussi vrai que si on ne trouve pas les traces d'une doctrine dans le Nouveau Testament, cette doctrine n'a aucune validité. Par exemple,en 1950, le Pape PIE-XII a proclamé l'assomption de Marie comme dogme. On ne trouve pas même une idée d'une telle chose dans l'Écriture. Marie de son vivant n'a pas reçu autant d'attention dans l'église primitive malgré sa présence. Ceci devrait être significatif. Dans ce sens, il faut affirmer haut et fort le Sola Scriptura tel que compris par les réformateurs. « 7. Tout dans l'Écriture n'est pas également évident, ni également clair pour tous (2 P 3.16). Cependant, ce qu'il faut nécessairement connaître, croire et observer en vue du salut est si clairement exposé et révélé dans tel ou tel autre passage de l'Écriture que l'ignorant, et pas seulement l'homme cultivé, peut, sans difficulté, en acquérir une compréhension suffisante (Ps 119.105,130) ». Néanmoins, force est de constater que dans les points les plus fondamentaux les évangéliques s'entendent. Dans la personne de Dieu, la divinité de Jésus-Christ, le salut par la foi et par la grâce, la primauté de la parole de Dieu, le retour personnel de Jésus-Christ et le jugement dernier, les évangéliques s'entendent. Le point d'encrage des évangéliques est le dépôt de la foi remis aux apôtres. 3) Qu'en est-il de la liturgie du culte ? Même dans sa façon de faire l'église, l'évangélisme, par sa simplicité et sa volonté de ressembler à l'église du Nouveau testament marque des points. Si réellement les apôtres avaient voulus « codifier » le culte tel le culte de l'ancien testament, ils l'auraient faits et nous l'aurions trouvé dans l'Écriture. Le problème – autant chez les catholiques que les orthodoxes – c'est que la liturgie ne vient pas directement des apôtres mais est le fruit de l'idéalisation d'une certaine époque 9que se soit Basile, ou Chrysostome). Les protestants font parfois de même. Les innovations de hier (les mélodies des chants de Luther prise dans la musique populaire de l'époque) sont parfois vues aujourd'hui comme des traditions autorisées comme si les chants d'une époque en particulier étaient plus « saints » ou « appropriés ». L'orgue aujourd'hui pratiquement irremplaçable dans l'église romaine a été vu – au départ comme une innovation presque démoniaque. Par contre, il faut aussi se rendre compte que si nous tentons de faire un culte semblable au Nouveau testament, il faut se rendre compte que nous transposons les principes du Nouveau testament plutôt que de faire comme eux (quelqu'un n'a qu'a visiter une église juive messianique pour s'en rendre compte). Nous tentons, en tant qu'évangélique, de vivre les principes du nouveau testament dans notre culture. Aussi, nous pouvons réaliser qu'il y a une richesse dans les 2000 ans d'histoire dernière nous et nous pouvons certainement y puiser pour profiter de la diversité des élus au travers les âges. Toujours, l'écriture doit être notre guide pour départager l'ivraie du bon blé. En somme, s'il est vrai que nous trouvons parfois une certaine « pauvreté » dans les cultes évangéliques (chose que l'on peut travailler), ailleurs n'est certainement pas mieux. Au contraire, le culte romain a une grande difficulté à rejoindre l'homme contemporain (et on parle de ramener le latin!) tout comme le culte orthodoxe. Le Nouveau Testament a été écrit dans le « grec koiné » et l'apport de chaque croyant faisait du culte un culte « en esprit et en vérité ». Le baptême n'est pas magique et n'efface rien en soit. Le baptême sans l'oeuvre de Jésus-Christ à la croix, le baptême sans la foi et la conversion et le baptême sans l'Esprit qui renouvelle le coeur et fait naître de nouveau n'est pas le baptême biblique. « 5. Bien que ce soit un péché grave de mépriser ou de négliger cette ordonnance (Lc 7.30 avec Ex 4.24-26), la grâce et le salut ne sont cependant pas si étroitement attachés au Baptême que nul ne puisse être régénéré, ou sauvé, sans lui (Rm 4.11; Ac 10.2,4,22,31,45,47), ou que tout baptisé soit indubitablement régénéré (Ac 8.13,23). 6. L'efficacité du Baptême n'est pas liée au moment particulier de son administration (Jn 3.5,8); pourtant, par le droit usage de cette ordonnance , la grâce promise est non seulement offerte, mais réellement présentée et conférée par le Saint-Esprit à ceux (adultes ou enfants) auxquels elle est accordée selon le conseil de la propre volonté de Dieu et au temps fixé par lui (Ga 3.27; Tt 3.5; Ep 5.25,26; Ac 2.38,41) ». « 8 C'est moi Jean, qui ai entendu et vu ces choses. Et quand j'eus entendu et vu, je tombai aux pieds de l'ange qui me les montrait, pour l'adorer. 9 Mais il me dit: Garde-toi de le faire! Je suis ton compagnon de service, et celui de tes frères les prophètes, et de ceux qui gardent les paroles de ce livre. Adore Dieu ». Dans ce passage, Jean est porté à se prosterner devant l'ange qui parle au nom de Dieu. L'ange équivaut son statut à celui de compagnon de service – comme tes frères les prophètes de l'AT. « Adore Dieu ». Ceci souligne aussi que nous devons pas adorer des « images » (ou des représentants de Dieu ». La mariolârtie et le culte des saints sont de l'idolâtrie. Comme tous les dogmes rajoutés, celui est le pire. Surtout lorsqu'on se rend compte que les papes et les conciles se contredisent avec le temps. Les limbes en sont un bon exemple. Elles n'existent plus depuis récemment. Deutéronome 18:21 Peut-être diras-tu dans ton coeur: Comment connaîtrons-nous la parole que l'Éternel n'aura point dite? 22 Quand ce que dira le prophète n'aura pas lieu et n'arrivera pas, ce sera une parole que l'Éternel n'aura point dite. C'est par audace que le prophète l'aura dite: n'aie pas peur de lui. Apocalypse 22:18 Je le déclare à quiconque entend les paroles de la prophétie de ce livre: Si quelqu'un y ajoute quelque chose, Dieu le frappera des fléaux décrits dans ce livre; 19 et si quelqu'un retranche quelque chose des paroles du livre de cette prophétie, Dieu retranchera sa part de l'arbre de la vie et de la ville sainte, décrits dans ce livre. Même si la citation d'Apocalypse se réfère premièrement au livre, il est clair dans l'Écriture que Dieu ne permet pas que son nom soit utilisé à la légère ou que quiconque se dit prophète prononce une parole que l'Éternel n'a point dite. Ayant lu de bonnes parties du catéchisme, de Vatican II et plusieurs théologiens catholiques sur plusieurs sujets, force est de constater, que sur plusieurs points les évangéliques et les catholiques s'entendent. Nous sommes beaucoup plus près théologiquement que ne le pensent la majorité de nos gens. Néanmoins, à chaque visite que je fais chez des catholiques, je constate avec tristesse que ce qui est crû et pratiqué par les gens de leur côté – ou enseigné par leur curés- ressemble étrangèrement à la caricature que nous nous faisons souvent des catholiques. En somme, si plusieurs évangéliques finissent par penser que nous sommes assez proches et que le mouvement catholique réussit à éviter certaines faiblesses évangéliques, je ne peux que dire haut et fort : nous ne nous ressemblons qu'en apparence et les différences réelles sont au coeur même de l'Évangile tel que révélé dans l'infaillible parole de Dieu. Voici donc quelques éléments de pourquoi je ne suis pas catholique et ne le serai jamais. Par contre, je reconnais que certains individus catholiques romains – prêtre, laïque ou théologiens - ont rencontrés le Christ ressuscité comme leur sauveur et Seigneur personnel. Néanmoins, le mot d'ordre demeure pour tout évangélique de prêcher l'Évangile aux catholiques comme nous le ferions avec tout inconverti. Il y a certainement une réforme à faire dans le milieu évangélique mais j'invite tous les croyants en Jésus-Christ, et tous nos théologiens et pasteurs à aider à toujours réformer notre église par l'Écriture. This book is a wonderful introduction to Scott Hahn, the editor of one of my study Bibles. This isn't the first conversion (to Catholicism) story I've read, but it is one of the most articulate and well-written. This book details the conversion stories of Scott and Kimberly Hahn--husband and wife--from faithful Presbyterians to faithful Catholics--first his story, then hers. Reading Scott's meticulous, step-by-step analysis of the concepts of sola fide and sola scriptura was impressive. In contr This book is a wonderful introduction to Scott Hahn, the editor of one of my study Bibles. This isn't the first conversion (to Catholicism) story I've read, but it is one of the most articulate and well-written. This book details the conversion stories of Scott and Kimberly Hahn--husband and wife--from faithful Presbyterians to faithful Catholics--first his story, then hers. Reading Scott's meticulous, step-by-step analysis of the concepts of sola fide and sola scriptura was impressive. In contrast, Kimberly's conversion story was a little harder to follow because her writing betrayed a snippy, almost begrudging tone. It was interesting, however, to read Kimberly's account of how the Holy Spirit led her to convert, while Scott converted after long and rather-painful study. This book flowed very well and was an interesting read. However, it gets 4 stars because I disliked how the writers reconstructed long conversations with people over the years by putting these conversations in quotation marks. Pages and pages of quoted conversations that could not have been remembered word-for-word and did not seem to have been taped. That writing style made me feel uneasy and wasn't necessary to tell Scott and Kimberly's stories. First impressions: This is for our next book discussion. I have low expectations and it is hard to get past this. First, I often feel like Scott Hahn is some sort of Uber Catholic and asking me to do and say what he does, but I do not always agree. The beginning is driving me crazy with its use of odd words - for instance Kimberly uses the word convicted when anyone else would use committed or convinced. These people are not my kind, but I have no choice but to go along. I am trying to have an o First impressions: This is for our next book discussion. I have low expectations and it is hard to get past this. First, I often feel like Scott Hahn is some sort of Uber Catholic and asking me to do and say what he does, but I do not always agree. The beginning is driving me crazy with its use of odd words - for instance Kimberly uses the word convicted when anyone else would use committed or convinced. These people are not my kind, but I have no choice but to go along. I am trying to have an open mind. Update. I am disliking Scott less than at the start, but still have no love for Kimberly. I am not reading this frequently, only as much as I need for my discussion group. I have 11 pages to read before group tonight. Good thing I asked someone else to lead. I finished the book and I was surprised at my feelings when finished. As a person who had her own surprising conversion, I could not help but find myself thinking of my conversion process as I read this. Scott came to Catholicism through study and logic; Kimberly by surprise. I came through surprise as well. It was interesting to learn how in trying to prove Catholicism wrong through careful study of scripture, Scott began to see that Catholicism was a fuller interpretation and understanding of God's word than the fundamentalist life in his Presbyterian denomination could ever be or hope to become. Because his journey was one of theological study and understanding, it had less impact on me than the journey Kimberly took. Much like me, Kimberly came in "kicking and screaming." Her faith and her fundamentalist upbringing caused her to feel betrayed when Scott began studying Catholicism and became Catholic. But through time she began to look at some of the beliefs of the church with reluctant surprise. Gradually some of the tenets and practices began to make sense. Her final hurdles required her to understand the Church's understandings on Mary and the Saints. When she saw that we honor Mary - not worship her - it became easier to talk to Mary as a mother, friend, and companion to be honored for her role in salvation history. She seemed shocked to end up ready to become Catholic, as shocked as I was by my return to Church. A highly readable, moving, and compelling memoir of a fervent anti-Catholic Protestant minister / theologian and his wife who became convinced of the truth of Catholicism. It won't answer every question but it's a great starting point. A friend at work and I were discussing Pope Francis, Catholicism, the Reformation, her being a "recovering Catholic" or "ex-Catholic" and something in our conversation reminded me about this book. I forgot that I had read it, at least for purposes of adding it to my goodreads shelf. So when I brought it to work to trade books with my colleague, it occurred to me to see if I'd marked it as read. I hadn't. Anyway, my wife discovered this book and read it. It was powerful affirmation for her as she A friend at work and I were discussing Pope Francis, Catholicism, the Reformation, her being a "recovering Catholic" or "ex-Catholic" and something in our conversation reminded me about this book. I forgot that I had read it, at least for purposes of adding it to my goodreads shelf. So when I brought it to work to trade books with my colleague, it occurred to me to see if I'd marked it as read. I hadn't. Anyway, my wife discovered this book and read it. It was powerful affirmation for her as she also had a powerful, soul-searching, and amazing journey from Protestantism to Catholicism when we were dating. I gobbled this book up as well, and felt the warm glow of convergence of thought, despite the author being a complete stranger to me. I recommend this book to anyone who is searching for answers to questions they have about organized religion, Christianity, Catholicism, and Church authority. I also recommend this book to practicing and non-practicing Catholics as it may help in some way their faith journeys as it did mine. What also struck me is that Kimberly, a loving wife and mother, found her biggest hurdle to acceptance of the faith, was the adoration of Mary. I found it ironic. I did learn more about my own faith by having read this book. I appreciate that Catholics need to embrace the Bible more as part of our faith. Compelling and dramatic story of an evangelical couple of the Presbyterian protestant tradition coming to intellectual discovery of the Apostolic descent of the Roman Church. What I appreciate the most is the Hahns' difficulty in letting their cultivated hatred of Catholicism go; it helps us understand not only the current protestant situation but also that of religions like Islam where children are counseled from early ages to reject (if not hate) Christians and Jews as deceivers. I realise tha Compelling and dramatic story of an evangelical couple of the Presbyterian protestant tradition coming to intellectual discovery of the Apostolic descent of the Roman Church. This story of Scott & Kimberly Hahn is moving and inspiring. I loved it. It's from the perspective of husband and wife when their views on religion change after a few short years into their marriage. It is heart-wrenching at times when the Hahn's tell their story (back and forth in chronology) of their conversion and acceptance into the Catholic faith. A moving story that will be challenging especially to Protestants who were raised in the reformed tradition. I was especially drawn to the ar This story of Scott & Kimberly Hahn is moving and inspiring. I loved it. It's from the perspective of husband and wife when their views on religion change after a few short years into their marriage. It is heart-wrenching at times when the Hahn's tell their story (back and forth in chronology) of their conversion and acceptance into the Catholic faith. A moving story that will be challenging especially to Protestants who were raised in the reformed tradition. I was especially drawn to the areas Scott confronted the doctrinal issue of Mary. He came to the understanding of how and why she is so revered in the Catholic Church, and he explained her in ways I wish all my non-Catholic friends could hear. This book is a great reminder for those rusty Catholics, and also for those non-Catholics searching for an easy read that will explain some of the important topics of my beliefs - my faith, the Catholic faith. Being a converted catholic myself, I enjoy hearing/reading conversion stories from others. It strengthens MY faith. With that being said, the reason that this conversion touched me so deeply is because Scott and Kimberly Hahn were baptized Prebyterian. He became a minister, and taught at a Theological University. Kimberly's dream was to be a minister's wife. They had it all! However, Scott set out to try to prove biblically that what Catholism teaches is total bunk. After years of trying to prov Being a converted catholic myself, I enjoy hearing/reading conversion stories from others. It strengthens MY faith. With that being said, the reason that this conversion touched me so deeply is because Scott and Kimberly Hahn were baptized Prebyterian. He became a minister, and taught at a Theological University. Kimberly's dream was to be a minister's wife. They had it all! This is the conversion story of a young couple, Scott and Kimberly Hahn. Scott Hahn was in seminary to become a Presbyterian minister, and Kimberly was the daughter of a Presbyterian minister. Scott was anti-Catholic, firmly believing Sola Scriptura. He and his fellow seminarians studied the Bible late into the night, discussing theology. Scott became a Catholic, not because he did NOT know the Bible well enough, but because he knew it “too” well. The Bible and 1st-5th century Church Father’s le This is the conversion story of a young couple, Scott and Kimberly Hahn. Scott Hahn was in seminary to become a Presbyterian minister, and Kimberly was the daughter of a Presbyterian minister. Scott was anti-Catholic, firmly believing Sola Scriptura. He and his fellow seminarians studied the Bible late into the night, discussing theology. Scott became a Catholic, not because he did NOT know the Bible well enough, but because he knew it “too” well. The Bible and 1st-5th century Church Father’s lead him straight to the Catholic Church. Scott and Kimberly have a humorous, gentle and engaging way of writing. I could hardly read this book without either crying, or laughing, or crying some more through each and every chapter. I highly recommend Rome Sweet Home. As a fellow convert to the Catholic faith, Scott and Kimberly's book brings me joy and also a deeper understanding of the faith. I can relate to the pain that one experiences when becoming Catholic means the loss of friends and the distancing of family members who oppose the faith. One must not be Catholic to appreciate this book. In fact, I wish more of my Protestant brothers and sisters would read this book, if only to clarify some misunderstandings of the faith that continue to circulate today As a fellow convert to the Catholic faith, Scott and Kimberly's book brings me joy and also a deeper understanding of the faith. I can relate to the pain that one experiences when becoming Catholic means the loss of friends and the distancing of family members who oppose the faith. One must not be Catholic to appreciate this book. In fact, I wish more of my Protestant brothers and sisters would read this book, if only to clarify some misunderstandings of the faith that continue to circulate today. Scott and Kimberly represent the most reluctant of converts, which makes their journey so compelling. The narrative is written in accessible terms so that non-theologians like myself can readily understand. there is something detached about this retelling. To open a window on things they hold dear. To soak more in the grace where they're now marinated. Please tell us just why you decided to do it!" The reasons are Scriptural; Marian, too. Yet haste in the telling's a small thing to rue.